This set makes carrying picks around a lot more convenient. Contains 9 pick tools and a tension wrench in a container designed to look like a fancy pen. 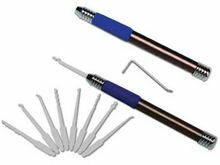 Nine tools make any lock possible to pick. All these tools in the space of a fancy pen. This pick set is very handy and discreet.